For a long time, my wife and I discussed making out a will. Who would we leave our children to should something unexpected happen to us? Where would our assets go? After a lot of soul searching and discussion, we figured out what we wanted and created a will stating these things. However, that didn’t cover all of our bases. I wanted to make sure that several personal items of mine would go to specific people in the event of my singular death. Although I completely trust my wife to handle this for me, I still desired to have a clear and legally binding explanation of what I wished to happen to a handful of personal items. It seemed to simple to be true – and it was, for my case. It turns out that I live in Iowa, where holographic wills are not legal (I eventually decided to trust my wife with the disbursement of such items). However, in twenty-five of the fifty states, a document as described above does actually function as a legal will. You’re kidding, right? According to Lawchek, a holographic will is in fact legally binding in many U.S. states. Some states require a witness, while other states do not require anything of the sort. Check that site to find out the specifics in your state. It may also be useful to call a lawyer in your state just to be sure of the specifics – this is a great question to ask if you have access to free legal counsel at some point. How exactly do I make a holographic will? All you have to do is write out, in your own handwriting, specifics on how you want your estate (or specific elements of your estate) to be disbursed to people. For example, you may want to explicitly list that certain personal items go to specific people and so on. You may also want to direct that all remaining assets go to someone in specific. You must also sign it at the bottom. In some states, you may have to have a witness who also signs the document – consult the rules in your state for more information. 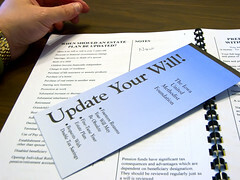 It is important that if you make such a will, you are specific and very clear with your wishes. It is probably worthwhile to include a blanket statement leaving the remainder of your estate to someone you trust so that if there are issues of ambiguity, you can have some faith that the person you trust will act in your interest anyway. When might a holographic will be useful? The most obvious situation is when you are in imminent danger of losing your life. For example, if you’re trapped in a cave during a snowstorm and you’re concerned you might not make it out alive, you may want to write a holographic will. A person might also write one out if they are terminally ill and want to make sure that their wishes are recorded because they believe the end is near. Should I go this route for making my own will? In short, no. Although it’s something very useful to know if you are in a desperate situation, the inconsistent legal nature of a holographic will makes it something not worth trusting your estate to unless you’re in that desperate situation. A much safer route would be to write out your wishes in the form of a holographic will as a draft of your real will, but then follow that exercise up with the creation of a true will with those principles. This way, you can be sure that it will be legally binding.